This delicious lemon cake is frosted with a lemon cream cheese frosting and filled with lemon curd. Preheat oven to 350 F. Grease and flour two 9-inch round cake pans, or spray with nonstick baking spray with flour. In large bowl, combine cake flour, baking powder, baking soda, ginger, and salt. In a mixing bowl, cream 3/4 cup of butter and sugar at medium speed until light and fluffy. Beat in egg yolks, one at a time, beating well after each. Beat in lemon juice and vanilla. With the mixer on low speed, beat in flour mixture alternately with buttermilk, beginning and ending with flour mixture (about 4 flour additions and 3 buttermilk additions). Beat just until blended. With a rubber spatula, gently fold egg white mixture, in thirds, into the cake batter. Spread batter in prepared pans. Bake 35 to 40 minutes, until cake tester inserted into the center comes out clean. Cool in pans on racks for 10 minutes. Invert onto racks and cool completely. In large mixing bowl, beat cream cheese and 3/4 cup of butter for 2 minutes, until fluffy. 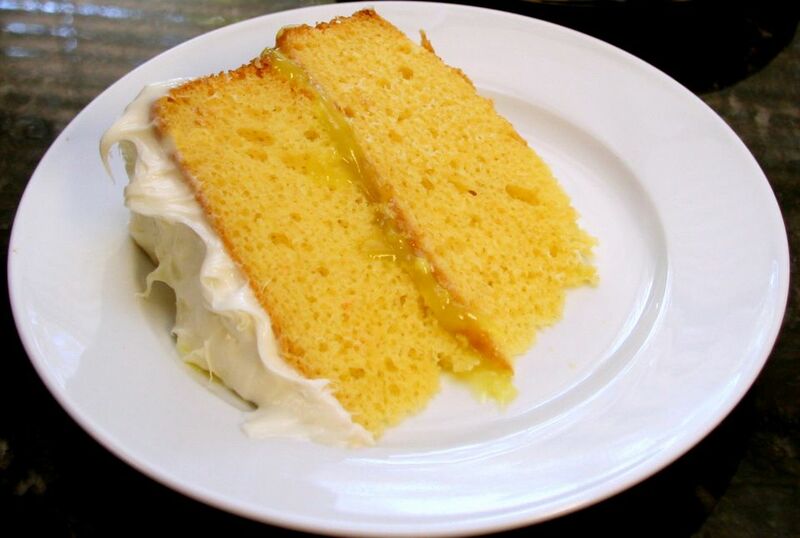 At low speed, beat in confectioners sugar, cream, and 1/3 cup of lemon curd until smooth. Cover; chill 20 minutes, until spreadable consistency. Using a serrated knife, level tops of layers if necessary. Place 1 layer on serving plate; spread with the 1 cup of lemon curd. Refrigerate for about 15 minutes to set the lemon curd. Frost the top and sides of the cake with the cream cheese frosting; refrigerate. Bring cake to room temperature before serving. Garnish with fresh berries or candied lemon slices, if desired.